Lee College alumnus Adrian Touchstone shares with guests at the 32nd annual Lee College Foundation Gala how receiving a scholarship from the foundation helped him complete his associate degree and find greater meaning and purpose in a life once characterized by drug addiction, prison stints and wrongheaded thinking. The foundation announced that proceeds from the gala and generous contributions from donors will allow $590,000 in student scholarships to be awarded for the 2017-18 academic year. BAYTOWN, TX — As hundreds of friends and supporters bid on auction items, enjoyed dinner and listened to stories of student success at the 32nd annual Lee College Foundation Gala last weekend, the foundation announced that proceeds from the fundraising event and contributions from donors will allow $590,000 in scholarships to be awarded to students this academic year. The awards — $440,000 in endowed scholarships and $150,000 in technical scholarships — will be available to all Lee College students: those enrolled in courses full-time or part-time, in dual-credit classes where high-school students can earn college credits, in non-credit classes offered by the Center for Workforce and Community Development, and in the Huntsville Center correctional education program. After a 20-year battle with drug addiction that kept him cycling in and out of prison, Lee College alumnus Adrian Touchstone welcomed faith into his life and made the decision to take ownership of his actions. A scholarship from the Lee College Foundation helped open the door to higher education and the chance to continue his transformation into a stronger, wiser and better man. Now pursuing a bachelor’s degree at the University of Houston Clear Lake, Touchstone maintained a perfect 4.0 GPA while at Lee College and graduated in May 2017 with an Associate of Applied Science degree in drug and alcohol abuse counseling. He hopes to be an inspiration and source of encouragement for others facing challenges similar to those he has conquered. “There have been times in my life that I have been hopeless. I had a backwards way of thinking. Love isn’t supposed to hurt, but selfishness and entitlement caused me to a hurt a lot of people who did love me,” said Touchstone, who shared his story at the gala and drew a standing ovation. Like Touchstone, many Lee College students would be unable to complete their chosen program without financial assistance from the foundation. For Samantha McDonnel, a teacher education major and mother of two who also works full-time in the Office of Financial Aid, an award from the foundation allowed her to cover tuition after spending the money she saved for her education to repair damage her home sustained during Hurricane Harvey. Lee College Pres. Dr. Dennis Brown echoed that sentiment, telling donors and gala guests that their financial support proved their belief in the college and support of its mission to help students create better and brighter futures through quality higher education. BAYTOWN, TX — After postponing its annual gala in the wake of Hurricane Harvey and making a generous donation to the Lee College Hurricane Harvey Relief Fund to help hundreds of students recover from the storm, the Lee College Foundation is finally ready to host its premiere event that raises much-needed funds for scholarships and other forms of student support. The 32nd annual Lee College Foundation Gala will be held this Friday, Nov. 10, at Sylvan Beach Pavilion. The gala is highly anticipated each year by Lee College supporters and individual and corporate donors throughout the community, who provide critical financial help to students pursuing a college education while enjoying an evening of dinner and entertainment. With nearly 400 guests in attendance and $175,000 raised, the 31st annual Foundation Gala held last year was an overwhelming success. Despite the difficulties experienced by those hit hardest by Harvey, the Foundation Board of Directors is hopeful this year’s gala will again be one for the record books. “Our foundation, from the generous support of our gala, creates opportunities for students who may not otherwise have them,” said Jennifer Marcontell, the newly elected chairwoman of the board. Under the board’s leadership, the foundation awarded more than $470,000 in the 2016-17 academic year to full-time and part-time students, high school students earning college credit in dual-enrollment classes, offenders in the Lee College Huntsville Center correctional education program, and students taking non-credit classes through the Center for Workforce and Community Development. In addition, the foundation maintains a Student Success Fund to help students facing extraordinary circumstances pay for college-related expenses. BAYTOWN, TX — After making its own generous donation this semester to help Lee College students affected by Hurricane Harvey afford the costs of tuition, textbooks, transportation, food and even home repairs, the Lee College Foundation is preparing to host its annual gala in November and raise funds to ensure students can continue their education and finish what they started. “Helping our students to recover quickly in order that they may focus on their education is in keeping with our board’s mission,” said Jennifer Marcontell, chairwoman of the Foundation Board of Directors. Board members make decisions for and lead the activities of the foundation, including raising outside funds to fulfill student needs and awarding scholarships to thousands of deserving recipients. To date, 174 students have received financial assistance from the college’s Hurricane Harvey Relief Fund, established shortly after the storm reached the local area. Contributions from the foundation and corporate and individual donors have been used to pay Fall 2017 tuition bills, purchase textbooks lost or washed away in floodwaters, buy gas or bus fare, and help fix home damages. Now, the board is hoping for another record crowd at the 32nd annual Foundation Gala set for Friday, Nov. 10, at Sylvan Beach Pavilion. The gala, which was initially postponed out of respect for those who suffered losses in Harvey, is the premiere event to raise money each year for scholarships and other forms of student support. 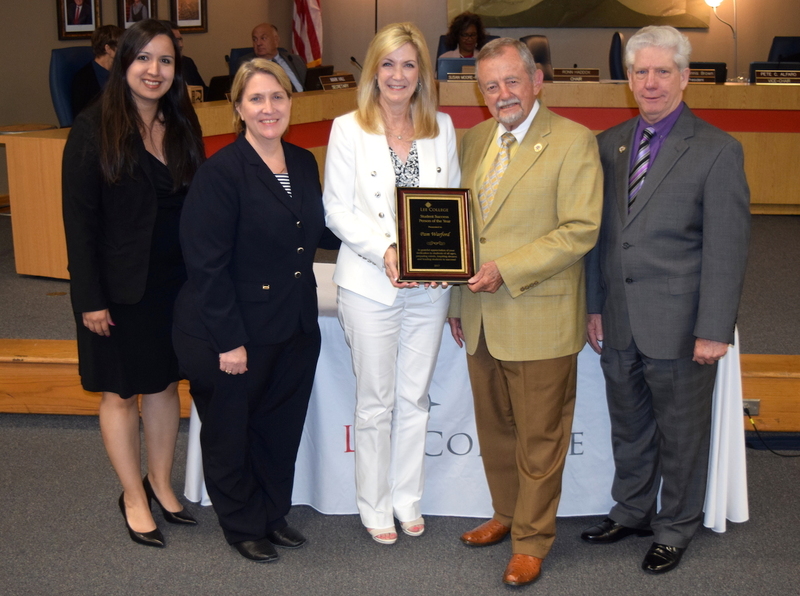 As chairwoman of the board, Marcontell’s goal is to provide encouragement and experience for her fellow “incredibly hard-working members.” Additional officers also elected to serve in 2017-18 include Judy Wheat as vice-chairwoman and Gilbert Santana as treasurer. For more information about the foundation or to purchase tickets for the 32nd annual Lee College Foundation Gala, contact Warford at 281.425.6361 or pwarford@lee.edu. BAYTOWN, TX — As residents in the local community continue to recover after Hurricane Harvey, the Lee College Foundation has decided to postpone its 32nd annual gala until November. Originally scheduled for Thursday, Sept. 21 at Sylvan Beach Pavilion, the Lee College Foundation Gala is now set for Friday, Nov. 10, at the same location. Foundation board members decided to delay the event — which raises money for scholarships and other forms of student support — out of respect for those affected by Harvey and working to rebuild after the storm. The foundation will be sending letters about the rescheduled gala to all those who have already received invitations, with additional correspondence to follow. For more information about the Lee College Foundation Gala or donating to the foundation, contact Warford at 281.425.6361 or pwarford@lee.edu. 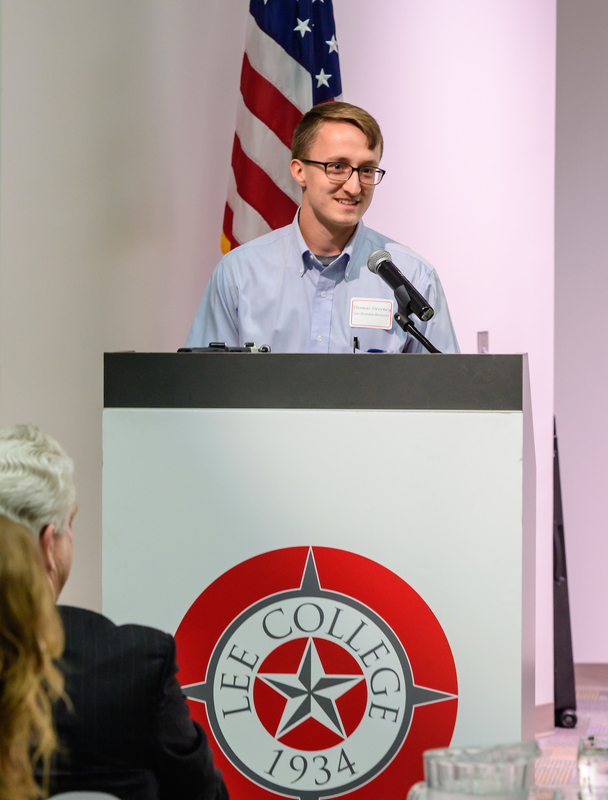 Lee College Foundation scholarship recipient Thomas Sweeney speaks at the annual Foundation Scholarship Breakfast in April about the scholarship awards that enabled him to pursue higher education and enjoy an enriching and rewarding campus experience. 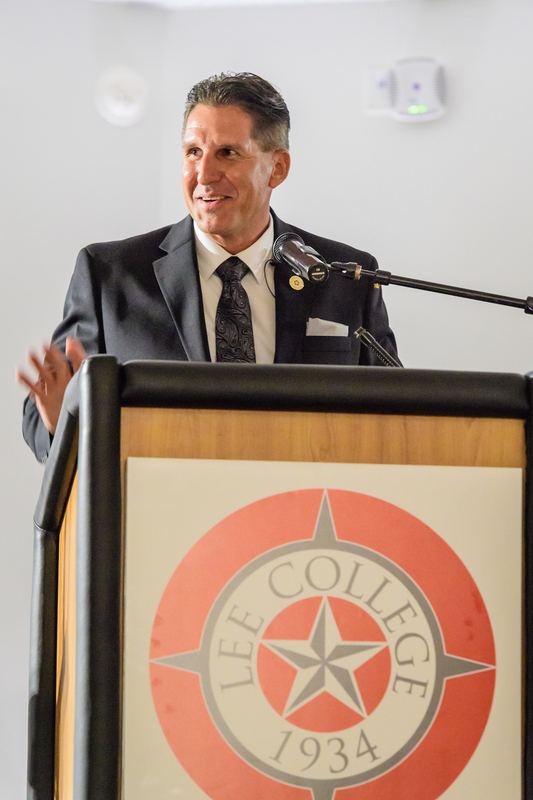 All students at Lee College are eligible for foundation scholarships, which are funded through the generosity of private and corporate donors throughout the community. BAYTOWN, TX — The fall 2017 semester begins next month and the Lee College Foundation is preparing to award scholarships to hundreds of deserving students both new to campus and returning to continue their journey to a degree or certificate. Many scholarship recipients would be unable to afford tuition, textbooks and other essentials without the generosity of private and corporate donors throughout the community who give to the foundation. Nearly two dozen of the new scholarships to be awarded for 2017 were sponsored by individuals – families, alumni, former employees and friends of the college among them – who believe in the importance of higher education and want to support students in reaching their dreams. All Lee College students are eligible to receive scholarships, regardless of their program of study or enrollment status. The Foundation Board of Directors awarded more than $470,000 in the 2016-17 academic year to full-time and part-time students, high school students earning college credit in dual-enrollment classes, offenders in the Lee College Huntsville Center correctional education program, and students taking non-credit classes through the Center for Workforce and Community Development. In addition, the foundation maintains a Student Success Fund to help students facing extraordinary circumstances pay for college-related expenses. Though a straight-A student throughout his career at Dayton High School, Thomas Sweeney arrived at the crossroads between high school and college unsure of which way to go. He knew he could succeed academically, but difficult family circumstances meant he was limited financially. Lee College was his choice for its affordability compared to other options, and he was ultimately awarded the foundation’s Rockwell Fund and Sam Bramlett Memorial scholarships. After taking several Lee College Honors Program courses and becoming involved in student organizations on campus, Sweeney was selected to present original research at two academic conferences and said he gained a greater appreciation for thinking critically about the world around him. His “enriching and self-fulfilling experience” in college would likely have been unattainable without foundation support. Planning is now underway for the 32nd annual Lee College Foundation Gala, which benefits student scholarships and other forms of support. For more information about the gala or giving to the foundation, contact Warford at 281.425.6361 or pwarford@lee.edu. Donors to the Lee College Foundation met the recipients of their scholarships Friday, April 7, 2017, at the 15th annual Foundation Scholarship Breakfast. The annual gathering allows students to share with donors how their generosity has made a difference. 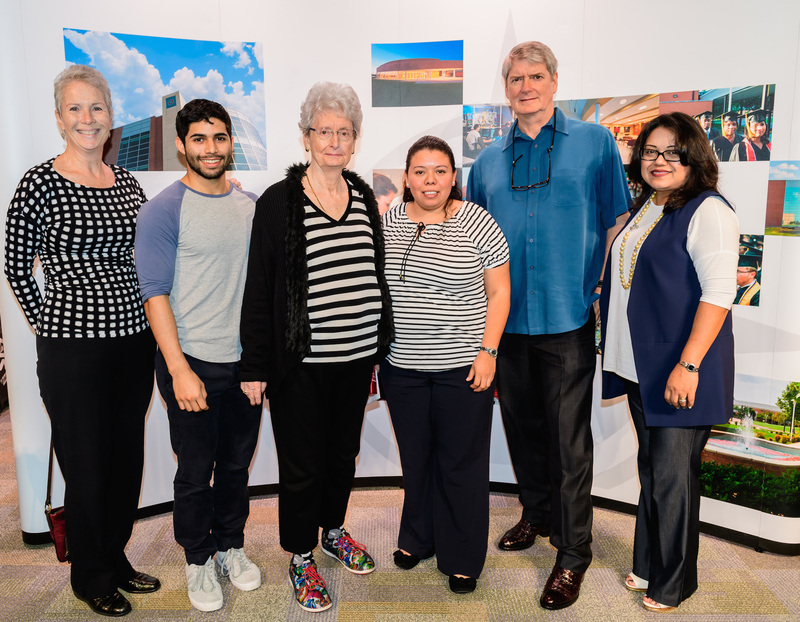 Pictured from left: Louise Mann, donor; Drake Salinas, student; Nancy Mann, donor; Denia Aleman, student; Michael Mann, donor; and Claudia Wyles, representing corporate donor Community Resource Credit Union. For the individuals and businesses that donate to the Lee College Foundation, there is no greater proof of the positive impact of their generosity than meeting and hearing the stories of students awarded tuition and textbook scholarships. Students like Maryori Portillo, a first-generation college student and recipient of the Wallace Heaner Tuition Scholarship and John and Stella Pepper Textbook Scholarship who had children at a young age and dropped out of high school. After earning her GED and experiencing difficulties in her first try at higher education, Portillo came to Lee College and enrolled in two classes: English and speech. Instructors recognized she had special talent, but the cost of out-of-district tuition and other expenses nearly forced her to quit school after just one semester. “They immediately saw potential in me that I didn’t see in myself and introduced me to the Honors Program,” Portillo shared April 7 at the 15th annual Foundation Scholarship Breakfast, where donors connected with scholarship recipients and learned firsthand how the funds made a difference in their lives. Or students like Audra Smith, a process technology major and intern at Chevron Phillips Chemical who received a workforce scholarship from the East Harris County Manufacturers Association (EHCMA). EHCMA donated $170,000 to Lee College this year for student scholarships and other support for craft and technology programs. The Lee College Foundation hosted a reception Tuesday, March 28, 2017, for students who received workforce scholarships from the East Harris County Manufacturers Association (EHCMA) to meet managers and other personnel from the association’s member companies. EHCMA donated $170,000 to Lee College this year for student scholarships and other support for craft and technology programs. 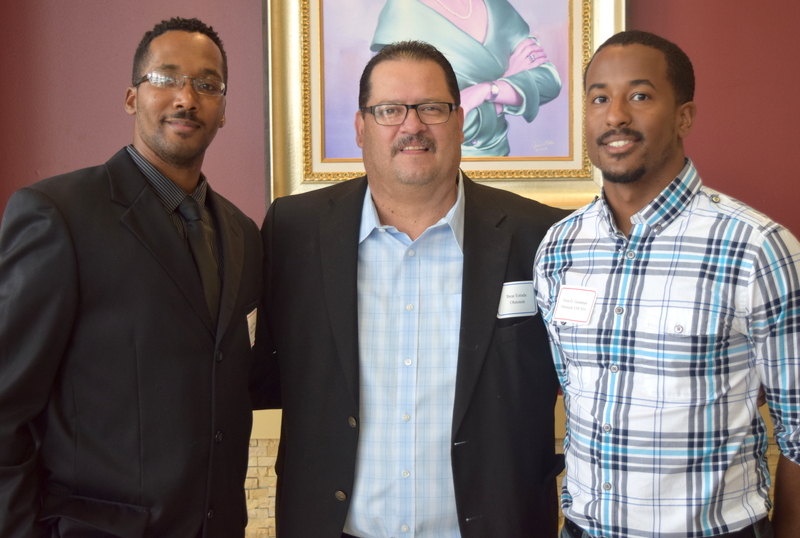 Pictured (l-r): Jarvis Booker, student; Bear Estrada of Ohmstede; and Tevin Goodman, student. Just before she started classes, Smith lost her home to a fire and learned her mother had been diagnosed with cancer. Four months into the program, her mother passed away – and soon after, so did her father and grandfather. Knowing she would not have to worry about paying for school helped her persist in the program despite her losses, determined to earn her degree and keep the promises she made to herself and her family. Under the leadership of its Board of Directors, the Lee College Foundation has raised outside funds since 1968 to provide for student needs. The fund balance for the foundation now exceeds $10 million and all students are eligible to receive scholarships — those pursuing academic and technical degrees, as well as those enrolled full-time, part-time, in dual-credit classes for high-school students to earn college credits, in non-credit classes offered by the Center for Workforce and Community Development, and in the Lee College Huntsville Center prison program. Although the foundation has historically focused on accepting scholarship funds, board members consider other worthwhile initiatives that directly affect student success and promote the student’s ability to reach their education goals. To that end, tax-deductible contributions from industry and private donors also support the Student Success Fund, created to help those facing extraordinary circumstances pay for college-related expenses that might otherwise derail their journey. For more information about donating to the Lee College Foundation, contact Executive Director Pam Warford at 281.425.6361 or pwarford@lee.edu.